Wester has long been a supporter of the college’s scholarship program. He started his first scholarship in the 1980s, recently elevating the Hutson Wester Insurance scholarship to the Presidential Merit Award status. He started the Virginia L. Wester Academic Achievement Scholarship in 2015 in memory of his former wife. He was also instrumental in endowing the Henderson Rotary Club Academic Achievement Scholarship in 2008. Now retired from Wester Insurance Agency in Henderson, Wester also taught Continuing Education classes on insurance at VGCC for several years. Brenda McGee Wester retired after 30 years as a Registered Nurse in 2005, having worked at Duke Raleigh Medical Center and Wake Medical Center as well as spending a portion of that time in State government. She received her Associate Degree in Nursing from Johnston Community College and is considering enrolling into a Bachelor of Science in Nursing program at a four-year institution, she said. Mrs. Wester said her career in Nursing was sparked by her mother’s interest in helping neighbors in the McGee’s Crossroads community while growing up as one of six daughters on a 100-acre tobacco farm in Johnston County. “My mother, Lillie McGee, was the one that they called on when a mother was having a baby,” said Mrs. Wester. “My mother was a nurse by what came natural to her,” serving as a midwife in addition to providing loving care to members of her family. In awarding the newest scholarship, preference will be given to students enrolled in eight or more credit hours in one of the college’s Nursing programs. A minimum grade point average of 2.5 will be required. VGCC offers Associate Degree Nursing, LPN to ADN Transition, RIBN (Regionally Increasing Baccalaureate Nursing) and Practical Nursing among its Health Sciences programs. The new scholarship will add to the more than 9,000 scholarships that have been awarded to students since 1982, funded by interest earned on the Endowment Fund and Scholarship Program. Scholarships have been established by individuals, industries, businesses, civic groups, churches and the college’s faculty and staff to assist deserving students. Tax-deductible donations to the VGCC Endowment Fund have often been used to honor or remember a person, group, business, industry or organization with a lasting gift to education. In the Fall of 2017, Vance-Granville awarded scholarships to 306 students. For more information, the Office of the Endowment can be reached by calling Endowment Specialist Kay Currin at (252) 738-3409. Image Information: Hutson Wester and his wife, Brenda, present a donation to Vance-Granville Community College’s Endowment Fund to start the Brenda McGee Wester, R.N., Academic Achievement Scholarship. 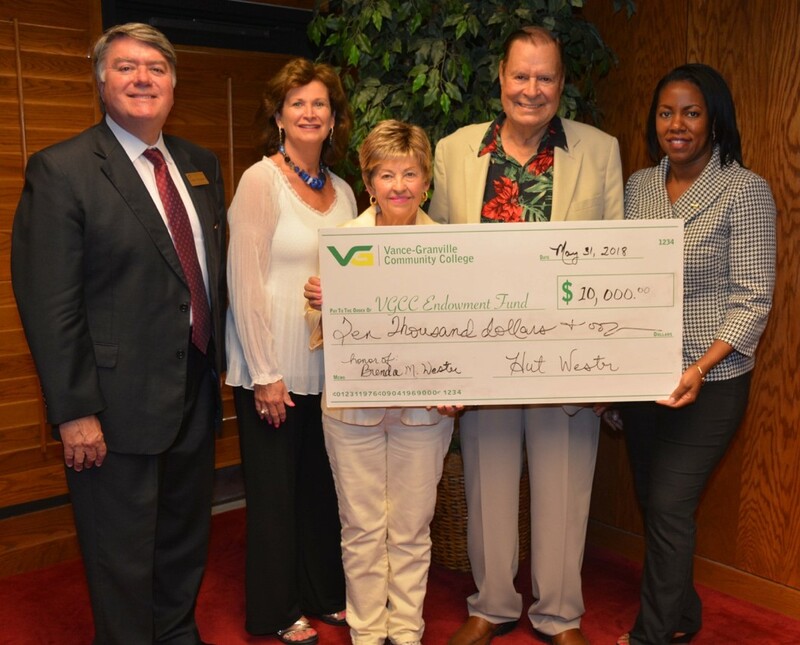 From left are Eddie Ferguson, Endowment Fund director; Kay Currin, Endowment specialist; Brenda Wester; Hutson Wester; and VGCC President Dr. Stelfanie Williams.